Judith Scott, Untitled (2003-4). Fiber and found objects, 45 × 47 × 31 in. Private collection. © Creative Growth Art Center. Photo: Addison Doty, Brooklyn Museum. This work appears on the winter 2016 issue of Signs. Using a shopping cart as a base, this sculpture is the largest and most complex in Scott’s body of work. The cart is used as a container for several smaller, unfinished sculptures, yet is presented as a larger baroque work on its own terms. The missing front wheels of the cart keep the sculpture stable, and allow it to rest on an incline that gives it a sense of movement. 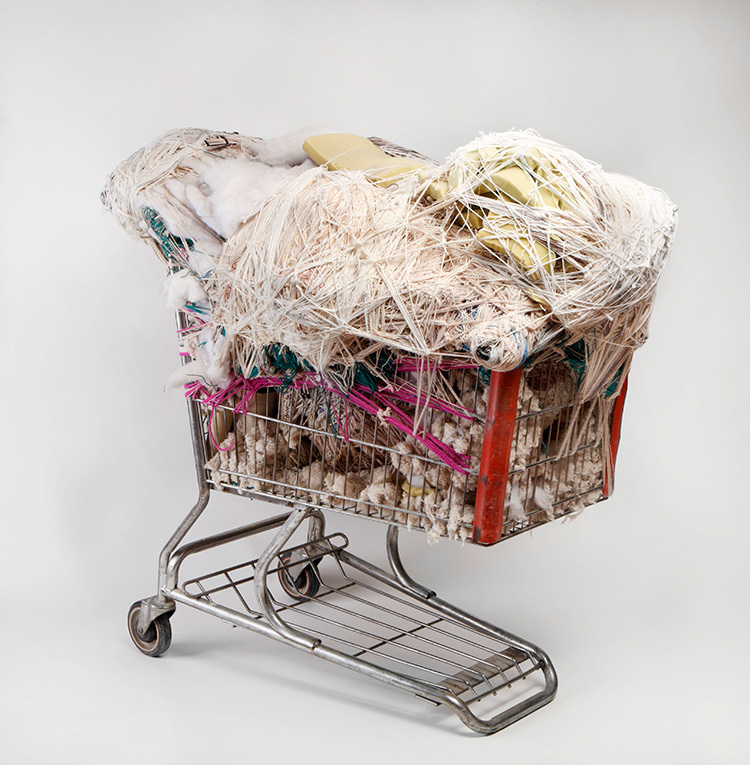 Judith Scott was a visual artist isolated from outside influences as a result of the impact of institutionalization, deafness, and Down’s syndrome. Against all odds, she became an independent and self-directed artist. During the eighteen years Judith made her work at Creative Growth Art Center in Oakland, California, she never repeated a form or color scheme. Crafting armatures of wood, cardboard, found materials, and discarded objects; Judith diligently wrapped each work with lengths of knotted cloth, fabric, or yarn. After years of life in an institution, the artist made her first sculpture art 1987 and went on to produce a remarkable, breathtaking body of mixed media sculptures. Considered by many to be an “outsider artist” her sculptures reflect little cultural input and are highly individualistic, reflecting her own unique personal vision. Her work is in the collections of the Museum of Modern Art, New York; the San Francisco Museum of Modern Art; Collection de l’Art Brut, Switzerland; the American Folk Art Museum, New York; and the Museum of Everything, London, and was most recently subject of a solo exhibition at the Sackler Center for Feminist Art at the Brooklyn Museum.